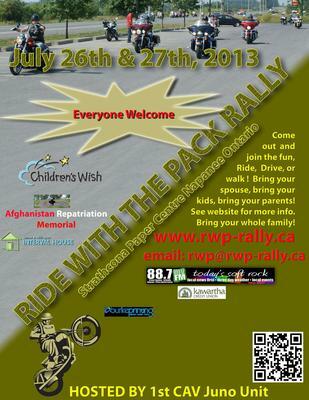 1 CAV (Canadian Army Veterans Motorcycle Units)Juno Unit are holding a Motorcycle Rally on 26 & 27 July 2013. There will be a meet and greet on Friday night with a show and shine and ride on Saturday. There will also be vendors, and displays for everyone. Pre-Registration is available. We are supporting three charities at our event. Childrens Wish, Interval House (Womens Shelter) and The Afghanistan Memorial Fund.